Over the past day, on September 23, the Russian-terrorist troops in Donbas fired for 35 times at the positions of the Joint Forces Operation (JFO), and as a result three Ukrainian soldiers were wounded. The Press Center of JFO reported this on Facebook page. Enemy troops opened fire from the grenade launchers, heavy machine guns and small arms. “Over the past day, the enemy opened fire at our positions in the settlement areas such as Krymske, Luhanske, Novoluhanske, Shumy, Pivdenne, Mayorsk, Pisky, Avdiivka, Chermalyk, Pavlopil, Hnutove, Vodiane, Lebedynske and Shyrokyne. 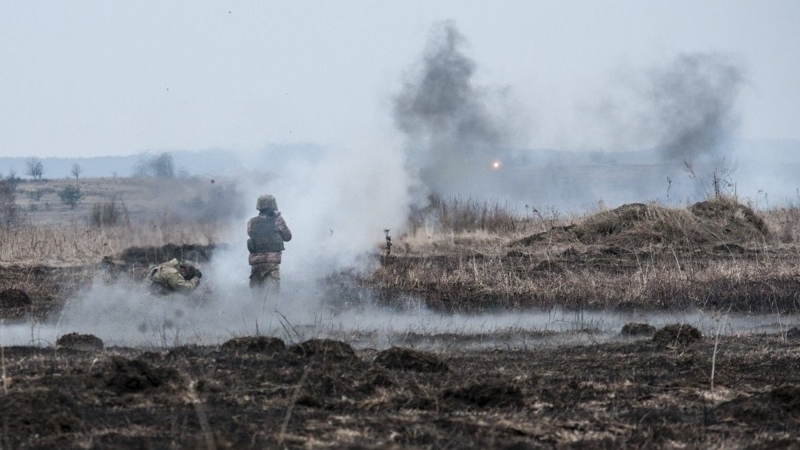 With the use of 82-mm mortars the enemy attacked the JFO positions near the settlements of Luhanske, Novoluhanske, Shumy, Pivdenne and Mayorsk. The supporting points of our troops near Luhanske and Novoluhanske as well were attacked with the use of 120-mm mortars. As a result, three Ukrainian soldiers were wounded." According to intelligence reports, four enemies were liquidated and another four were wounded. Earlier, the Ukrainian Ministry of Defense reported that on the temporarily occupied territories of Donetsk and Luhansk regions, with the participation of the Russian military the number of crimes and delinquencies have increased. These crimes are hidden by the Russian Occupation Command.